What’s going on in the distant reaches of our Solar System? Is there a Planet 9 out there? Out in the frigid expanse of our System, there are bodies on orbital paths that don’t make sense in terms of our eight-planet Solar System. There seems to be an undiscovered body out there, several times more massive than Earth, shaping the orbits of some Kuiper Belt Objects (KBOs), and driving astronomers to look deeper and more thoroughly into the extreme reaches of our System. What they’re looking for is the mysterious, and so far unproven, ninth planet. Is there or isn’t there a Planet 9? Is there a planet way out on the outskirts of our Solar System, with sufficient mass to explain the movements of distant objects? Or is a disc of icy material responsible? There’s no direct evidence yet of an actual Planet 9, but something with sufficient mass is affecting the orbits of distant Solar System objects. Antranik Sefilian, a PhD student in Cambridge’s Department of Applied Mathematics and Theoretical Physics. Their results are published in the Astronomical Journal. In January of 2016, astronomers Mike Brown and Konstantin Batygin published the first evidence that there might be another planet in our Solar System. Known as “Planet 9” (or “Planet X”, to those who contest the controversial 2006 Resolution by the IAU), this hypothetical body was believed to orbit at an extreme distance from our Sun, as evidenced by the fact that certain Trans-Neptunian Objects (TNOs) all seem to be pointing in the same direction. Since that time, other lines of evidence have emerged that have bolstered the existence of Planet 9/Planet X. However, a team of researchers from CU Boulder recently proposed an alternative explanation. According to their research, it could be interactions between Kuiper Belt Objects (KBOs) themselves that might explain the strange dynamics of “detached objects” at the edge of the Solar System. The researchers presented their findings at the 232nd meeting of the American Astronomical Society, which ran from June 3-7 in Denver, Colorado. The presentation took place on June 4th during a press conference titled “Minor Planets, Dwarf Planets & Exoplanets”. The research was led Jacob Fleisig, an undergraduate studying astrophysics at CU Boulder, and included Ann-Marie Madigan and Alexander Zderic – an assistant professor and a graduate student at CU Boulder, respectively. For the sake of their study, the team focused on icy bodies like Sedna, a minor planet that orbits the Sun at a distance ranging from 76 AU at perihelion to 936 AU at aphelion. Along with a handful of other objects at this distance, such as Eris, Sedna appears to be separated from the rest of the Solar System – something which astronomers have struggled to explain ever since it was discovered. Sedna was also discovered by Michael Brown who, along with Chad Trujillo of the Gemini Observatory and David Rabinowitz of Yale University, spotted it on November 14th, 2003, while conducting a survey of the Kuiper Belt. In addition to orbiting our Sun with a period of over 11,000 years, this minor planet and other detached objects has a huge, elliptical orbit. What’s more, this orbit does not take them Sedna or these other objects anywhere near to Neptune or any other gas giant. Unlike Pluto and other Trans-Neptunian Objects (TNOs), it is therefore a mystery how they achieved their current orbits. The possible existence of a as-yet-undiscovered planet (Planet 9/Planet X), which would be about 10 times the size of Earth, is one hypothetical explanation. While Madigan and her team did not originally set out to find another explanation for the orbits of “detached objects”, they ended up pursuing the possibility thanks to Jacob Fleisig’s computer modelling. While developing simulations to explore the dynamics of the detached objects, he noticed something very interesting about the region of space they occupy. What Fleisig’s computer model showed was that Sedna’s orbit goes from normal to detached as a result of those small-scale interactions. It also showed that the larger the detached object, the farther it gets away from the Sun – something which agrees with previous research and observations. In addition to explaining why Sedna and similar bodies behave the way they do, these findings may provide clues to another major event in Earth’s history. This would be what caused the extinction of the dinosaurs. Astronomers have understood for a long time that the dynamics of the outer Solar System often end up sending comets towards the inner Solar System on a predictable timescale. This is the result of icy objects interacting with each other, which causes their orbits to tighten and widen in a repeating cycle. And while the team is not able to say that this pattern was responsible for the impact that caused the Cretaceous–Paleogene extinction event (which resulted in the extinction of the dinosaurs 66 million years ago), it is a fascinating possibility. In the meantime, the research has shown just how fascinating the outer Solar System is, and how much remains to be learned about it. The research was made possible thanks to the support of the NASA Solar System Workings and the Rocky Mountain Advanced Computing Consortium Summit Supercomputer. In January of 2016, astronomers Mike Brown and Konstantin Batygin published the first evidence that there might be another planet in our Solar System. Known as “Planet 9” (“Planet X” to those who reject the controversial 2006 Resolution by the IAU), this hypothetical body was believed to orbit at an extreme distance from our Sun, as evidenced by the fact that certain Trans-Neptunian Objects (TNOs) all seem to be pointing in the same direction. Since that time, more and more evidence has been produced that show how the presence of Planet 9 affected the evolution of the Solar System, leading it to become as it is today. For example, a recent study by a team of researchers from the University of Michigan has shown how Planet 9 may have kept certain TNOs from being destroyed or ejected from the Solar System over the course of billions of years. The study, which was recently published in the Astronomical Journal under the title “Evaluating the Dynamical Stability of Outer Solar System Objects in the Presence of Planet Nine“, was led by Juliette Becker, a graduate student with the University of Michigan’s Department of Astronomy. It was supported by Professors David Gerdes and Fred Adams, as well as graduate and undergraduate students from UofM’s Depart of Physics. For the sake of their study, Becker and her colleagues conducted a large set of computer simulations that examined the stability of Trans-Neptunian Objects (TNOs) who’s orbits are believed to have been influenced by Planet 9. In each simulation, the researchers tested a different version of Planet 9 to see if its gravitational influence would result in the Solar System as we know it today. From this, they uncovered two key findings. First, the simulations showed that Planet 9 may have led to the current Solar System by preventing these TNOs from being destroyed or ejected from the Solar System. Second, the simulations indicated that TNOs can jump between stable orbits, a process they refer to as “resonance hopping”. This would prevent these same TNOs from being thrown out of the Kuiper Belt. Next, Becker and her team examined the TNOs to see if they experienced resonance with Planet 9. This phenomena, which occurs as a result of objects exerting a gravitational influence on each other, causes them to line up in a pattern. What they found was that, on occasion, Neptune will push a TNOs out of its orbital resonance, but does not disturb it enough to send it towards the Sun. A plausible explanation for this behavior was the gravitational influence of another object, which serves to catch any TNOs and confine them to a different resonance. In addition, the team also considered a newly-discovered TNO that was recently detected by The Dark Energy Survey collaboration – a group of 400 scientist from 26 institutions in seven countries, which includes several members from the University of Michigan. This object has a high orbital inclination compared to the plane of the Solar System, where it is tilted at 54° relative to the Sun’s ecliptic. After analyzing this new object, Becker and team concluded that the object also experiences resonance hopping, which is consistent with the existence of Planet 9. This, along with other recent studies, are creating a picture where it is harder to imagine the Solar System without Planet 9 than with it. Planet 9 cannot hide forever, and new research has narrowed the range of possible locations further! In January of 2016, astronomers Mike Brown and Konstantin Batygin published the first evidence that there might be another planet in our Solar System. Known as “Planet 9” (“Planet X” to some), this hypothetical body was believed to orbit at an extreme distance from our Sun, as evidenced by the orbits of certain extreme Kuiper Belt Objects (eKBOs). Since that time, multiple studied have been produced that have attempted to place constraints on Planet 9’s location. The latest study once again comes from Brown and Batygin, who conducted an analytical assessment of all the processes that have indicated the presence of Planet 9 so far. Taken together, these indications show that the existence of this body is not only likely, but also essential to the Solar System as we know it. The study, titled “Dynamical Evolution Induced by Planet Nine“, recently appeared online and has been accepted for publication in The Astronomical Journal. Whereas previous studies have pointed to the behavior of various populations of KBOs as proof of Planet 9, Brown and Batygin sought to provide a coherent theoretical description of the dynamical mechanisms responsible for these effects. In 2016, Brown and Batygin described the first three lines of observational evidence for Planet 9. These include six extreme Kuiper Belt Objects which follow highly elliptical paths around the Sun, which are indicative of an unseen mechanism affecting their orbit. Second is the fact that the orbits of these bodies are all tilted the same way – about 30° “downward” to the plane of the Kuiper Belt. The third hint came in the form of computer simulations that included Planet 9 as part of the Solar System. Based to these simulations, it was apparent that more objects should be tilted with respect to the Solar plane, on the order of about 90 degrees. Thanks to their research, Brown and Batygin found five such objects that happened to fit this orbital pattern, and suspected that more existed. Since the publication of the original paper, two more indications have emerged for the existence of Planet 9. Another involved the unexplained orbits of more Kuiper Belt Objects which were found to be orbiting in the opposite direction from everything else in the Solar System. This was a telltale indication that a relatively close body with a powerful gravitational force was affecting their orbits. And then there was the argument presented in a second paper by the team – which was led by Elizabeth Bailey, Batygin’s graduate student. This study argued that Planet 9 was responsible for tilting the orbits of the Solar planets over the past 4.5 billion years. This not only provided additional evidence for Planet 9, but also answered a long standing mystery in astrophysics – why the planets are tilted 6 degrees relative to the Sun’s equator. Recent studies have also shed some light on how and where Planet 9 originated. Whereas some suggested that the planet moved to the edge of the Solar System after forming closer to the Sun, others have suggested that it might be an exoplanet that was captured early in the Solar System’s history. At present, the favored theory appears to be that it formed closer to the Sun and migrated outward over time. Granted, there is not yet a scientific consensus when it comes to Planet 9 and other astronomers have offered other possible explanations for the evidence cited by Batygin and Brown. For instance, a recent analysis based on the Outer Solar System Origins Survey – which discovered more than 800 new Trans-Neptunian Objects (TNOs) – suggests that the evidence could also be consistent with a random distribution of such objects. In the meantime, all that remains is to find direct evidence of the planet. At present, Batygin and Brown are attempting to do just that, using the Subaru Telescope at the Mauna Kea Observatory in Hawaii. The detection of this planet will not only settle the matter of whether or not it even exists, it will also help resolve a mystery that emerged in recent years thanks to the discovery of thousands of extra-solar planets. In short, thanks to the discovery of 3,529 confirmed exoplanets in 2,633 solar systems, astronomers have noticed that statistically, the most likely types of planets are “Super-Earths” and “mini-Neptunes” – i.e. planets that are more massive than Earth but not more than about 10 Earth masses. If Planet 9 is confirmed to exist, which is estimated to have 10 times the Mass of Earth, then it could explain this discrepancy. Planet 9, we know you’re out there and we will find you! Unless you’re not, in which case, disregard this message! In January of 2016, astronomers Mike Brown and Konstantin Batygin published the first evidence that there might be another planet in our Solar System. Known as “Planet 9”, this hypothetical body was believed to orbit at an extreme distance from our Sun. Since that time, multiple studies have been produced that have had tried to address the all-important question of where Planet 9 could have come from. Whereas some studies have suggested that the planet moved to the edge of the Solar System after forming closer to the Sun, others have suggested that it might be an exoplanet that was captured early in the Solar System’s history. A recent study by a team of astronomers has cast doubt on this latter possibility, however, and indicates that Planet 9 likely formed closer to the Sun and migrated outward during its history. Their study, titled “Was Planet 9 Captured in the Sun’s Natal Star-Forming Region?“, recently appeared in the Monthly Notices of the Royal Astronomical Society. The team was led by Dr. Richard Parker from the University of Sheffield’s Department of Physics and Astronomy, with colleagues from ETH Zurich. Together, they conducted simulations that cast doubt on the “capture” scenario. The existence of Planet 9 (or Planet X, for those who maintain that Pluto is still a planet) was first suggested in 2014 by astronomers Chad Trujillo and Scott S. Sheppard, based on the unusual behavior of certain populations of extreme Trans-Neptunian Objects (eTNOs). From a number of studies that took place over the next few years, constraints were gradually placed on the basic parameters of this planet. Essentially, Planet 9 is believed to be at least ten times as massive as Earth and two to four times the size. It also believed to have a highly elliptical orbit around the Sun, at an average distance (semi-major axis) of approximately 700 AU and ranging from about 200 AU at perihelion to 1200 AU at aphelion. Last, but not least, scientists have estimated that Planet 9 takes between 10,000 and 20,000 years to complete a single orbit of the Sun. For the sake of their study, the team conducted simulations of the Solar System when it was still in its “nursery” phase – i.e. in the early process of formation. While interactions with other star systems (and their planets) are known to be common in this period, the team found that even where conditions were optimized for the sake of capturing free-floating planets, the odds of Planet 9 being captured were quite low. If Planet 9 was not captured, then there remains only one possibility: ut formed closer to our Sun and gradually migrated beyond the orbit of Neptune, reaching distances occupied only by the most extreme Kuiper Belt Objects. And while the hunt of this elusive and mysterious planet is ongoing, any research which places additional constraints on its characteristics and origin are extremely useful. By ruling out different scenarios in which the planet formed, researchers are also raising new questions about the history and evolution of our Solar System. From when did all the planets we know come from? Did they form in their current orbits, or did migration play a role? These and other questions are sure to be raised and addressed as we close in on Planet 9. In January of 2016, astronomers Mike Brown and Konstantin Batygin published the first evidence that there might be another planet in our Solar System. Known as “Planet 9”, this hypothetical body was estimated to be about 10 times as massive as Earth and to orbit that our Sun at an average distance of 700 AU. Since that time, multiple studies have been produced that either support or cast doubt on the existence of Planet 9. 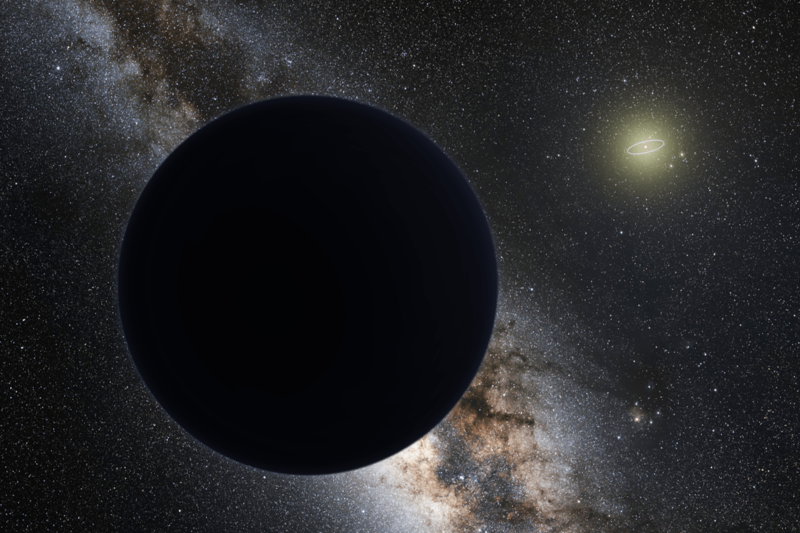 While some argue that the orbits of certain Trans-Neptunian Objects (TNOs) are proof of Planet 9, others argue that these studies suffer from an observational bias. The latest study, which comes from a pair of astronomers from the Complutense University of Madrid (UCM), offers a fresh perspective that could settle the debate. Using a new technique that focuses on extreme TNOs (ETNOs), they believe the case for Planet 9 can be made. Extreme Trans-Neptunian Objects are those that orbit our Sun at average distances greater than 150 AU, and therefore never cross Neptune’s orbit. As the UMC team indicate in their study, which was recently published in the Monthly Notices of the Royal Astronomical Society, the distances between the ETNOs nodes and the Sun may point the way towards Planet 9. These nodes are the two points at which the orbit of a celestial body crosses the plane of the Solar System. It is at these points that the chances of interacting with other bodies in the Solar System is the greatest, and hence where ETNOs are most likely to experience a drastic change in their orbits (or a collision). By measuring where these nodes are, the team believed they could tell if the ETNOs are being perturbed by another object in the area. “If there is nothing to perturb them, the nodes of these extreme trans-Neptunian objects should be uniformly distributed, as there is nothing for them to avoid, but if there are one or more perturbers, two situations may arise. One possibility is that the ETNOs are stable, and in this case they would tend to have their nodes away from the path of possible perturbers, he adds, but if they are unstable they would behave as the comets that interact with Jupiter do, that is tending to have one of the nodes close to the orbit of the hypothetical perturber”. For the sake of their research, Doctors Carlos and Raul de la Fuente Marcos conducted calculations and data mining to analyze the nodes of 28 ETNOs and 24 extreme Centaurs (which also orbit the Sun at average distances of more than 150 AUs). What they noticed was that these two populations became clustered at certain distances from the Sun, and also noted a correlation between the positions of the nodes and the inclination of the objects. “Assuming that the ETNOs are dynamically similar to the comets that interact with Jupiter, we interpret these results as signs of the presence of a planet that is actively interacting with them in a range of distances from 300 to 400 AU. We believe that what we are seeing here cannot be attributed to the presence of observational bias”. As already mentioned, previous studies that have challenged the existence of Planet 9 cited how the study of TNOs have suffered from an observational bias. Basically, they have claimed that these studies made systematic errors in how they calculated the orientations in the orbits of TNOs, in large part because they had all been directed towards the same region of the sky. By looking at the nodal distances of ETNOs, which depend on the size and shape of their orbits, this most recent study offers the first evidence of Planet 9’s existence that is relatively free of this bias. 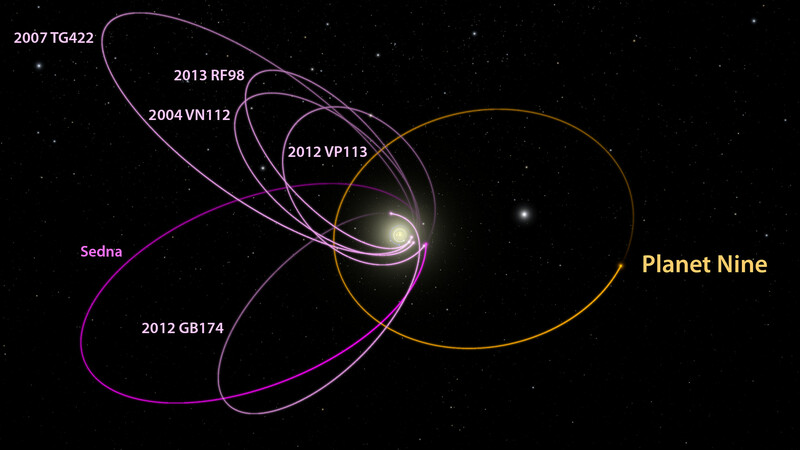 At the moment, only 28 ETNOs are known, but the authors are confident that the discovery of more – and the analysis of their nodes – will confirm their observations and place further constraints on the orbit of Planet 9. “Given the current definition of planet, this other mysterious object may not be a true planet, even if it has a size similar to that of the Earth, as it could be surrounded by huge asteroids or dwarf planets. In any case, we are convinced that Volk and Malhotra’s work has found solid evidence of the presence of a massive body beyond the so-called Kuiper Cliff, the furthest point of the trans-Neptunian belt, at some 50 AU from the Sun, and we hope to be able to present soon a new work which also supports its existence”. It seems that the outer Solar System is getting more crowded with every passing year. And these planets, if and when they are confirmed, are likely to trigger another debate about which Solar bodies are rightly designated as planets and which ones aren’t. If you thought the “planetary debate” was controversial and divisive before, I recommend staying away from astronomy forums in the coming years!